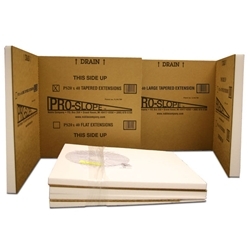 Patented preformed composite made from expanded polystyrene (EPS) with a reinforced cutting template that creates a code required slope under the waterproofing membrane in a full mortar bed application. Kit includes one Positive Weep Protector, one 40" x 40" Pro-Slope, and 2 Tapered Extensions (one small; one large) to create 1/4" per foot slope to drain located at one end. See Installation Instructions for more information. • Durable: Rated at 500 lbs./sq. ft.